Reducing cart abandonment is a tricky process in which seemingly simple tweaks result in significant performance changes. This means that, with some careful testing, implementing a seemingly small change to your established cart can have a big, positive impact on efficacy. Today, we’re going to talk about a few visual changes you can test on your own site to reduce cart abandonment. A quick look at the image above gives you an idea of how varied in contrast and screen real-estate cart notifiers can be. Despite how small they appear, these notifiers are extremely important to the average user experience. Without a prominent reminder of cart contents and order size, consumers rack up frustrations with cart duplicates and accidental adds. Reduce cart abandonment by giving readers a clear, conspicuous way to seeing cart contents in brief and have it double as a hyperlink to a more detailed cart page. Some websites opt to include the dollar value of the items within the cart on the notifier itself. By putting the dollar value of the cart on every pre-checkout page, the consumer is given a constant picture of their final bill as they continue to browse. This is a particularly interesting strategy to test, especially in conjunction with a threshold-based shipping offer. The example above comes directly from Foot Locker‘s front page. It’s no coincidence that the value of the active cart is so close to the mention of free shipping on orders over $75. While testing this on your site, keep an eye on both conversion rates and average order values. Once users have added a product to their cart, it’s time to move them further down the conversion funnel. The product-page to shopping-cart leap can be achieved in a number of ways. Consider the following techniques to move shoppers along while reducing cart abandonment. One of the most commonly used techniques used to move customers from browsing to the cart is the expanding cart view. The concept is simple: When a visitor adds an item to their cart, a miniature preview of your cart expands into view (usually tied to the cart notifier). Typically, the call-to-action attached to these expanding cart views direct users towards checkout, but are discrete enough to encourage further browsing. Another technique for directing the consumer to the cart from product pages is to use an interstitial cart page. 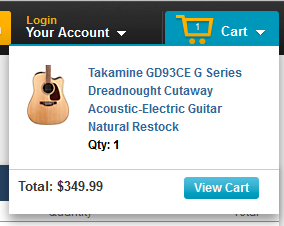 When a user adds a product to their cart, they’re automatically directed to a new page between product and cart pages. The example above from Office Depot is a more aggressive example of the interstitial cart page. You’ll notice that there’s a prominent “Continue to Cart” button, but outside of the normal navigation header, there’s no “continue shopping” option. Sometimes, these tactics reduce cart abandonment and push consumers into checkout. Other times, however, restricting navigation prematurely will promote abandonment. Test different techniques on your site and find the right balance between suggestive and aggressive. In the last few years, coupon codes have become a topic of debate among online vendors. As coupon codes became increasingly popular, consumers came to expect them for nearly every site. For the savvy shopper, seeing a coupon field initiated a search through promo code aggregators as one of the final steps in the typical shopping process. The problem here is that the savvy shopper leaves your website in search of a promo code and, in many cases, when no satisfactory discount is located, the cart is left abandoned. However, when used properly, promo codes have been proven to increase site performance. So, what tweaks can you make to ensure that promo codes work for you instead of against you? Use traffic source to segment your visitors and display the promotional code field only to those who you’ve given a code. For example, if you’ve sent out a promotional email promising a 10% discount, make sure the code field only displays to those who come through that link. To make the process more automatic, auto apply the coupon on clickthrough. Although this method isn’t quite as foolproof as segmenting by traffic source, a clever technique is to turn your promo code field into a simple string of text. As a customer, if you have a promo code on hand, you’re liking scanning the page for somewhere to put it. Otherwise, you may simply glance over the prompt. Notice how much attention the expanded field above from AE.com demands because of the orange CTA. Comparatively, the subtle hyperlink is easy to gloss over. By consistently testing and trying new techniques, you’ll find a number of small changes that can significantly reduce cart abandonment. The strategies discussed today are just the tip of the proverbial iceberg in finding that perfect, optimized balance. For more information on reducing cart abandonment or traffic optimization in general, contact UpSellit!